My house is exactly one year old today! Happy Birthday, house! Well, technically, my house was built in 1956, so it’s really 57 years old, but who’s counting? It’s a year old to me and I love it as much today as I did when I stepped into it 13 months ago and had to mow down the other five people trying to buy it. Victory! Since I moved in, I’ve made a few updates. I’ve painted every inch of it (ceilings, walls, trim, base boards, cabinets, doors, and the entire exterior). I’ve installed new hardware on my doors and cabinets. I’ve installed a new water heater (not by my choosing), put in an awesome new Hansgrohe faucet in my kitchen and Santec faucet in my bathroom, installed marble on my bathroom vanity, and a few other odds and ends. I’m still working on decorating it, with the help of Kristina Wilson of Kristina Wilson Design, but that’s the fun part. So what’s the not-so-fun part? I’ll tell you: my 60-year old water oak trees. If it’s not the leaves falling by the bag-full, it’s the acorns dropping by the ton; and if it’s not the acorns dropping by the ton, it’s the very, very, VERY large branches falling and littering up my yard. I was sweeping and scooping in the fall (hi acorns! 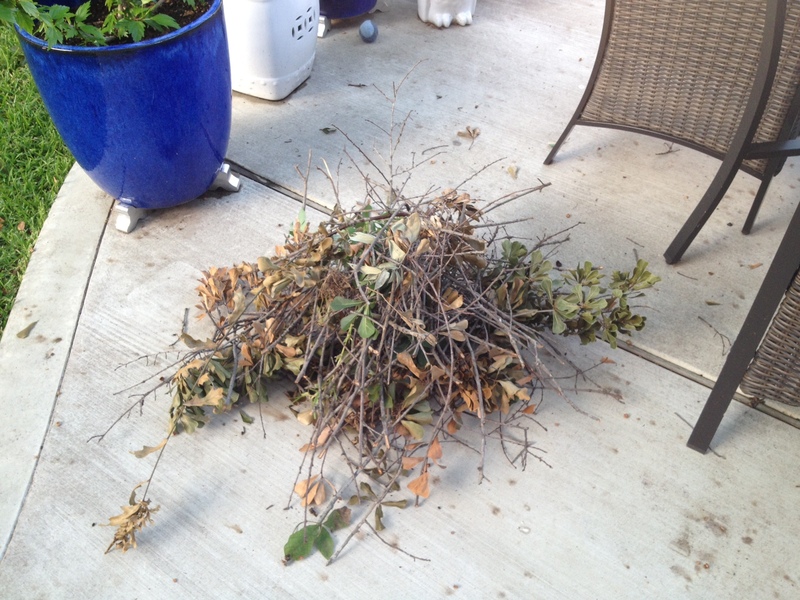 ), raking in the winter (hi leaves!) and am now building small bonfires in the summer (hi branches!). It looks something like this on the daily. Don’t get me wrong — I adore every square inch of my house and yard. There is literally nothing I’d change. Nothing! But it’s true what they say: there really is always something to do when you own a home. I have had more than a few moments where I’ve wished I was back in my no-maintenance condo rather than logging trees in my backyard. That or wishing I had a really, really cute yard boy. Either or.